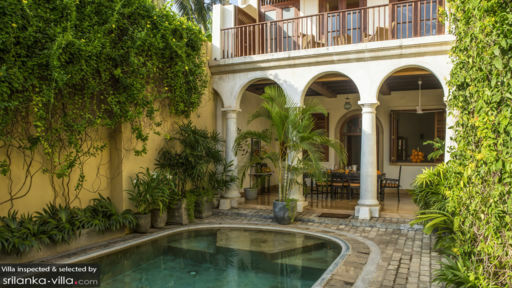 Thambili House is a grand, 300-year old, two-level villa that epitomizes classic European architecture – especially with its conspicuous columns, arches and wood lattices – and luxury. Interiors are appointed with mostly 16th to 18th century, elaborate, ebony and calamander furnishings as well as adorned, in contrast, with contemporary artisan pieces. The villa is equipped throughout with first rate fittings – for your all-out convenience and enjoyment. Owned by a cinnamon trader during the Dutch colonial period, Thambili House has been masterfully restored to afford you privileged vacation living with an ambience that is, most certainly, old world. On the second level are the villa’s three air-conditioned bedrooms – the Cinnamon Suite, the Ginger Suite and the Nutmeg Suite. Each bedroom is connected to a bathroom. 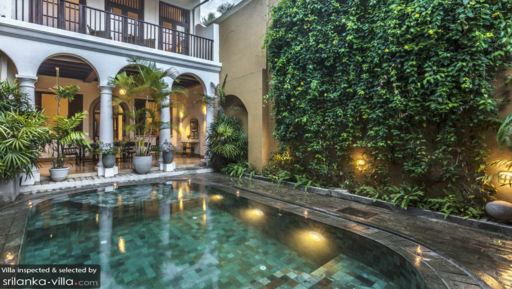 The villa’s courtyard is almost completely devoted to the beckoning, oblong shaped swimming pool where you can just wade aimlessly about or splash playfully around. On a covered terrace adjacent to the swimming area is the alfresco dining area. Indoors is the living area where you can all converge to marvel at this historic villa’s rare conversation pieces. An amiable, professional butler will attend to anything you may need or want. 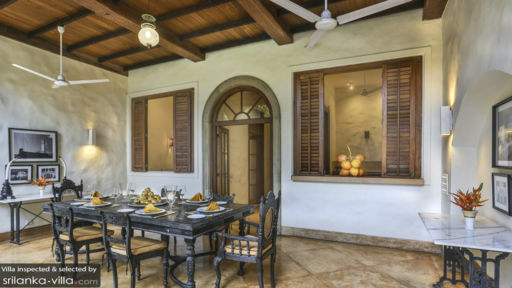 Thambili House is based in Galle Fort – once a 16th century Dutch trading post and now distinguished as a UNESCO World Heritage Site. Close to the villa – which is an attraction in itself – are the Fort Rampart, the Masjid Meera Jumma Mosque and the Galle Fort Light House.